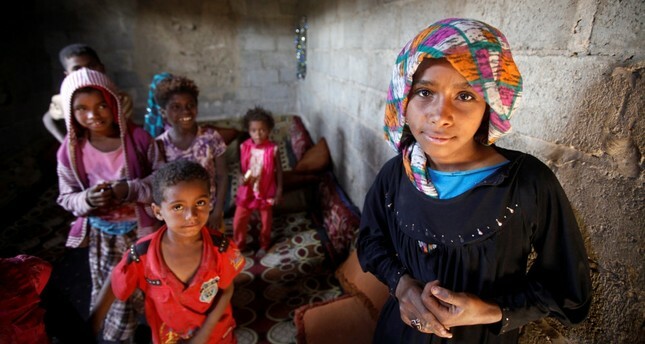 Children displaced from the Red Sea port city of Hodeidah stand in their shelter in Sana'a, Yemen, Nov. 1. Yemen is one of the worst humanitarian crises we have faced this century. The lack of a serious international peace initiative in Yemen has resulted in daily airstrikes killing civilians and a blockade that has resulted in a famine affecting millions. Talks between the Iran-backed Houthis and the Saudi Arabia and United Arab Emirates-backed Yemeni government started in Sweden this week, providing some hope that the three-year war that has killed 70,000 to 80,000 Yemenis so far will finally end. This Swedish meeting is just the latest chapter in a process that started a year ago and almost collapsed in September. The civil war has already caused the total collapse of the country's health care system. The medical infrastructure has deteriorated to the point where it is non-existent. Prisoners and hostages taken by both sides are even worse off. While it has become a cliché, in Yemen, women and children suffer the most. This war is more of a humanitarian disaster organized by both sides than a war. A number of U.N. reports have desperately warned that this is the worst crisis in the world right now and things will deteriorate even further if nothing is done. U.N. Emergency Relief Coordinator Mark Lowcock said last week that 75 percent of the 24 million population urgently needs humanitarian assistance. Some 1 million people have contracted cholera. Starvation is one reason why the epidemic has spread rapidly among children. Fighting has already displaced 3 million people who are forced to live under conditions and places inappropriate to live in or survive. For civilians, the war has been a disaster beyond imagination. It has destroyed the country's infrastructure, schools, hospitals and affected civilians, but not the externally backed fighting groups. Ports have been besieged and destroyed, preventing the delivery of food supplies. Trucks carrying desperately needed supplies such as food and medicine cannot reach those who need them. Land food supply lines have been disrupted, and food prices have shot up. Geert Cappelaere, the Middle East director for UNICEF, told reporters last month, "We have evidence that today in Yemen every 10 minutes a child under the age of 5 is dying from preventable diseases and severe acute malnutrition." He added that already 1.8 million Yemeni children are malnourished and are dying from vaccine-preventable diseases. Another thing further complicating this terrible man-made tragedy is the appearance of human smugglers, who materialize wherever there is a humanitarian catastrophe. Human smugglers have used the chaos in Yemen to turn the county into a transfer point, and with no significant authority in the ports, it makes the situation even worse for the Yemeni people. Many people who had hoped to go to Europe have been stranded in a war zone. Joel Millman, a spokesperson for the U.N. international organization for migration, announced last week that 150,000 people arrived in Yemen in 2018 hoping to make it to Europe. Progress is urgently needed in Sweden. The situation in Yemen is getting worse, not day-by-day, but "by the hour," as Johannes Van Der Klaauw, the U.N.'s humanitarian coordinator in Yemen, warned in 2015 when he called for an "immediate humanitarian pause of at least a few hours each day in Yemen to allow desperately needed aid to enter the conflict-ravaged country." He said that in a very early phase of the war when 650 had died and a further 2,000 were injured. However, as the numbers of dead and injured grow, warnings by the U.N. have had the same distraught tone since. One thing is for sure, we don't have a problem in determining, forecasting and estimating crises – we seem to have a problem in de-escalating them.